I'm on Assignment 2b of Just Bento's Bento 101, which entails figuring out what bento works for your own bento-ing needs. You can find her post on the assignment here. The short answer for me is that it depends on what I feel like that day. Long answer requires going though all the pros and cons of my own collection. 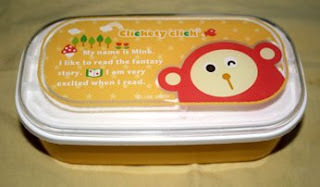 This is an updated post of my bento supply since 2009. Original 2009 post can be found here. 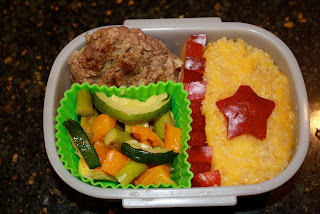 Surprisingly, not a lot has changed bento-wise, but there have been a lot of life changes since then including the birth of my now 3 year old son and the fact that most of our bentos are now the stay-at-home variety. ^ My first bento! 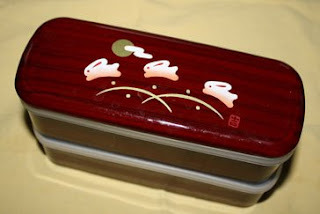 This cute little rabbit bento was my official reality check on the actual size of bento boxes. 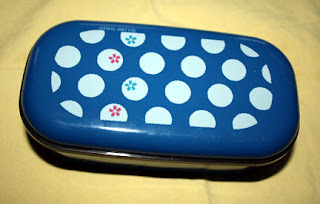 It's as tall as it is wide and I find it hard to fit my own lunch into this thing as the width is only about 1.5 inches. However, it's a great size for my 3 year old son. Capacity 250/250ml. 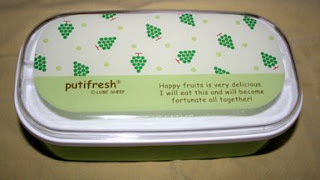 ^ I have 4 of these two-tiers Lube Sheep bentos. They each collapse into one-tier for storage which is awesome for those of us with limited storage space, plus you can use just the top tier for packing a small meal or snack. I'm always impressed with how much food it fits. 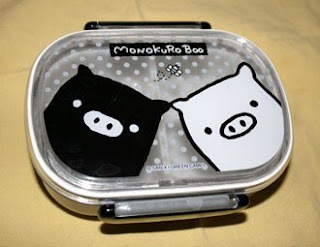 This is my go-to box when I use a "real" bento box. Capacity 330/250ml. ^ My second bento ever. I purchased this little cutie about the time I got my first rabbit bento. Once again, I was shocked at the small size. The box is great for snacks or lunch for my son. Capacity 350ml. 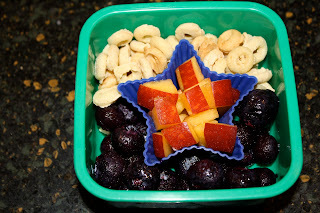 ^ The Snack Bento Trio. 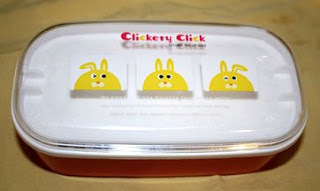 I do love my Clickety Click bentos. Unfortunately, baby Ethan enjoyed playing with my bento supplies and ended up breaking the clips on the bunny cap. These are a great size for snacks or little man breakfasts. Capacity 320ml each. ^ Three-tier Metal Tiffin. 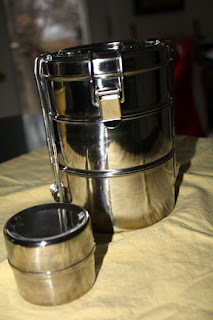 I bought this tiffin awhile back, but admit to rarely using it. The containers are too big for my typical meal use and not microwaveable, but it's great for those bulky/high-volume foods like salad, fruit or a sandwich on a bun. 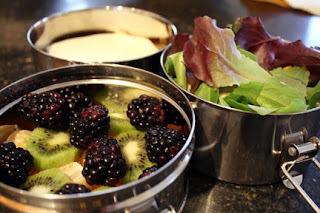 The little tin got a lot of use for a snacky cracker container when I was pregnant with my son. ^ The Laptop Lunch Boxes. My kitchen was graced with the presence of a laptop lunchbox long before I dreamed of owning a bento box. These boxes are so easy to use and make eating a meal with several food groups nearly inevitable. I guess you could fill the entire box with nothing but spaghetti , but why?! I love that you can place a single inner container in the microwave without disturbing the cold food, plus it's dishwasher friendly, which is very important to me! Since this photo was taken, I've added a Bento Lunch Box 2.0 to the collection. 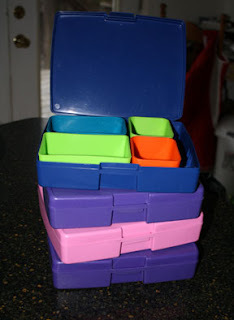 Even though they are not technically bento boxes, I love these lunch boxes more than any of the others I own. 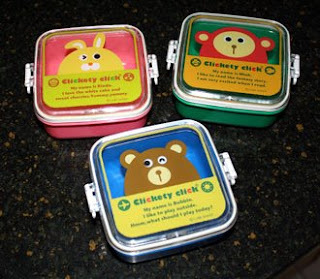 My son has a lot of dietary restrictions due to his allergies, so we use these regularly to pack to-go meals if we're going to be away from home at meal times. The only drawback is that you should keep them upright to avoid spilling and shifting. Some of the containers have tops to contain liquids, but I find the tops always break, shrink or warp over time. Otherwise, it's been a perfect box for us! It holds about 3 cups of food which is roughly 700ml. ^ Last year, we added LunchBots to our collection of boxes. My husband has claimed the Uno for himself and uses it almost daily to pack his sandwich. Ethan uses the Pico for his school snack. It's no where close to full for his snack, but is a great size for a preschool lunch or large adult snack. The Duo doesn't get used much since it's not microwaveable, but seems like a good size for an adult lunch and the boxes are dishwasher safe except for the tops. Capacity is 420ml for the Pico, 600ml for the Uno and Duo.